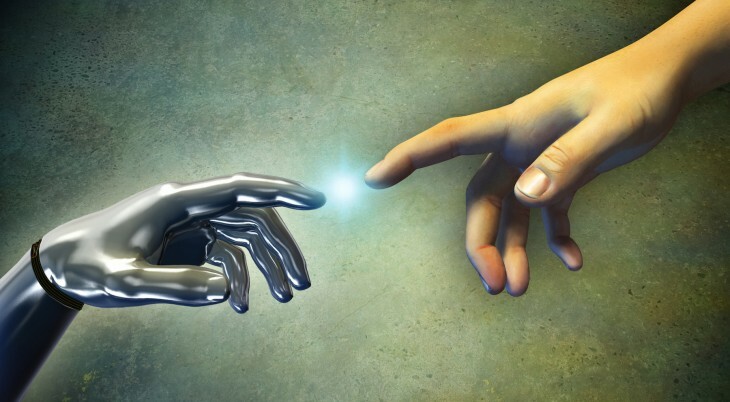 Man vs. Machine: Which is Better at Converting Sales? Ofer Yourvexel is the CEO of WRNTY, developing leading order taking apps and sales management software. Technology replaces people – that’s a fact. The things that made our society more productive could now be contributing to its decline as humans are less in demand. But have we arrived at the point where the salesman is no longer needed at all? Let’s find out in the ultimate battle of man versus machine. Behavioral targeting, big data, predictive analytics – these buzzwords, now a part of burgeoning businesses, claim to be able to help companies sell. With tools like SalesPredict, you can enter the data of your prospects and predictive analytics can instantly let you know the conversion odds. Research shows that artificial intelligence works, but what about the sales rep? You can use these well-researched technologies to target and predict the actions of leads, but when it comes to closing the deal, there’s nothing like human interaction. An online ordering form won’t notice pictures of your kids in your office, chat you up on golf because they see your “Golf Lover” coffee mug, or sense in the tone of your voice that it’s not a good time to talk. Even the companies that sell these analyses advertise them as a chance to prioritize sales calls, not as a way to eliminate salespeople. Key takeaway: Artificial intelligence and predictive technologies help the sales rep, but can’t replace them. Intelligence might think of “items you would like “or “buyers who bought this also bought,” but it’s hard to create a desire from online materials only. It’s also one of the biggest challenges in the predictive analytics world. It took over three years, more than 100 million pieces of data to train the suggestion engine, and some of the top scientists in the world to capture the Netflix Prize. The goal was to improve the recommendations of Netflix by more than 10 percent using algorithms. So whatever predictive suggestions a computer might use, not only are they limited in their success rate, they’re limited in their ability to create desire. This is particularly true in B2B where buyers can get lost in the tedium of their usual order and miss out on new offerings, some of which can offer them more profit, greater market share, and new opportunities. Salespeople take the hard work out of the regular order and let the customer think about other things, like new products. They also take on the complex task of deciding when to upsell, what to suggest, and how to create desire. Key takeaway: Predictive suggestions are a must have feature for most e-commerce sites, but can be even more powerful when combined with a salesperson who can add their human intelligence to not only find things people might like, but create desire for things people didn’t even know existed. Ordering online is easy, it’s convenient, and most people feel that sites are secure enough to order. And if not, most credit card companies won’t hold you liable for fraudulent charges. People are relaxed about ordering online, and when mistakes happen, it’s usually no problem to return something from an online purchase. However, when you’re talking about a B2B context, a business’s reputation is much more important than their inventory. Even the smallest mistakes can cost money, time, and a good reputation. Small ordering mistakes can cripple a business. Business owners want to feel secure when they make purchases and a salesperson can provide the feeling that they’re ordering everything OK, but also that someone else is looking out for them. When you contact customer support, do you feel better when you receive a machine response or from an actual person? Key takeaway: The security of ordering online is not what we mean when we say security of ordering through a sales rep. Salespeople provide peace of mind, and that’s a huge difference. Surveys are great, they provide lots of feedback. They’re relatively inexpensive to run and can help you instantly find out what people think. However, there are limitations. The type of people willing to answer a survey can skew your results, it’s hard to trust paid surveys, and what customers say in a survey might not always reflect their actual needs. But focus groups are passé, you say? Not so. They might be called “beta testing” or go by other names, but the concept is still the same. The best way to receive feedback is to start a conversation. No need to entice customers into taking a survey when you can get a person to engage on a personal level. Key takeaway: Surveys are valuable tools, but are no match for the interaction a sales rep has with customers. According to research, potential customers abandon online shopping carts at an astounding rate of 68 percent! There is no doubt that online shopping has a serious problem closing the deal. One reason that salespeople are so invaluable to a business is because they can close a deal. Compare your online shopping completion rates against your businesses’ rate of purchase with salespeople and you’ll see the value of salespeople immediately. A devoted salesperson can give you a staggeringly delightful ROI. Key takeaway: There are technologies designed to help win back customers who’ve abandoned an online shopping cart, but those take a longer time to convert than a human rep.
For our foreseeable future, the human salesperson is here to stay. In fact, leading companies are hiring for sales big time: Facebook has 300 sales openings, Microsoft has over 700! And it’s not just technology companies. Consumer goods giant Proctor & Gamble has more than 200 open positions in sales; the same goes for Unilever. Technology may make things more efficient, but we must not forget the value of personalization and human interaction. Embrace the future, but don’t forget the basics.